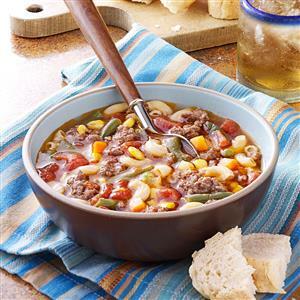 This quick and easy vegetable beef soup can be a hearty meal on a busy weeknight. You can even prep it and pop it into a slow cooker to be warm when you come home. Some people felt that it made a better soup if you cooked the macaroni al dente and then did a cold water rinse to stop the cooking separately from the soup. I’ve noticed this before when I make minestrone soup. By the next day, the pasta has absorbed a ton of the broth and is bloated up. It’s still tasty when I reheat it, but I do need to add in more broth to get a thinner soup. Watch the video here to see how fast it is. You can find the full recipe at Taste of Home. I may consider adding in barley instead of macaroni. Barley has more fiber. If you can find pearl barley, it cooks faster. There’s also alternative pastas like amaranth or rice pasta that has less carbs. But as I’m always saying, it’s a balance. If you’re just eating this and not adding in a biscuit or cornbread, go for what makes you happy. I’d look into fun shapes as well like small shells, gemelli and campanelle. You could add in more broth and use alphabet noodles. I’d also use less beef and add in mushrooms. They provide a nice meaty taste. You could use ground turkey in place of beef. With a good beef broth, you won’t notice too much. I would make sure I found a low sodium beef broth and then salt to my personal taste. I wouldn’t use stock since I think that’s not necessary. A good quality beef broth will make a delicious soup. You’d honestly have to change a lot to make this recipe low carb. But it’s very possible. First, you could use riced cauliflower in place of pasta. It would seem more like barley. So definitely add in mushrooms here. You’d need to get different frozen vegetables since corn and lima beans are out. You could use frozen spinach, peas and carrots, and green beans to make it veggie packed and stay on the keto plan. If you are into bone broth, you could use that in here for additional collagen. Some people feel there’s a better flavor. I say do what works.